The Garmin flight plan format is used to import flight planes into the Garmin GTN GPS serial.If a waypoint in the GFP file is ambiguous or cannot be found by the loaded database, it will be marked as “LOCKED” in the Garmin GPS. When importing to Garmin, click “Save”, then “EDIT” and delete the locked waypoint. This format is used by flight simulator FSX and P3D. (Only the newer Xml format is supported by the present software. It supports airway names and you will get a full converted flight plan. Please take in account that the Garmin known waypoints are depending from the loaded database ! 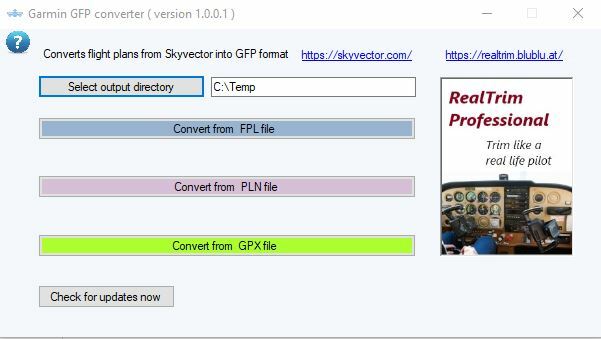 Copy the created GFP file either to the Garmin GTN Trainer FPL folder or to the Flight1 Garmin FPL folder. You will find instruction how to do it into the Flight1 Garmin Manual. Northwest Performance Software, Inc. (NWPS) grants you a limited non-exclusive license to use FREEWARE downloadable from NWPS for personal, educational, charity, and commercial use, and donations are entirely optional. If you are using the SOFTWARE free of charge under the terms of this Agreement, you are not entitled to support although we will respond to support requests if they relate to any SOFTWARE that is not performing it’s task correctly (bugs etc). (ii) copy, distribute, publicly display, or publicly perform content contained in this Freeware other than as expressly authorized by this Agreement. – You will not use my Freeware to engage in or allow others to engage in any illegal activity. – You will not engage in using my Freeware that will interfere with or damage the operation of the services of any third parties by overburdening/disabling network resources through automated queries, excessive usage or similar conduct. – You will not sell my Freeware or charge others for use of it (either for profit or merely to recover your media and distribution costs) whether as a stand-alone product, or as part of a compilation or anthology, without explicit prior written permission. – You will not use my Freeware to engage in any activity that will violate the rights of third parties, including, without limitation, through the use, public display, public performance, reproduction, distribution, or modification of communications or materials that infringe copyrights, trademarks, publicity rights, privacy rights, other proprietary rights, or rights against defamation of third parties.